A synthesis of recent thinking and results from practitioners and researchers of Living Shorelines just hit the stands. 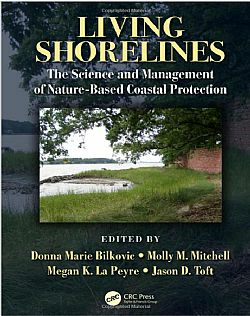 “Living Shorelines: The Science and Management of Nature-Based Coastal Protection,” details many aspects of the shoreline stabilization approach, and specifically includes: (1) background: history and evolution; (2) management, policy, and design; (3) synthesis of Living Shoreline science: physical and biological aspects; and (4) summary and future guidance. Researchers from the National Centers for Coastal Ocean Science participated in the project. Carolyn Currin, Jenny Davis, and Amit Malhotra contributed a chapter entitled "Response of Salt Marshes to Wave Energy Provides Guidance for Successful Living Shoreline Implementation". The multi-faceted chapter provides information pertaining to the: energetic determinants of marsh habitat distribution; relationship between shoreline wave energy and marsh erosion rates; and the ability of fringing marshes to attenuate waves and trap sediments. The chapter also describes the results of a case study of natural and stabilized fringing salt marsh from central North Carolina and combines these results with those from the literature review to provide guidance on the physical settings in which fringing marsh and hybrid living shorelines can be considered. Coastal ecosystem functions have diminished as estuarine and coastal shorelines have been managed mostly to support human infrastructure and economic benefits. Coastal management has evolved to include the use of nature-based shoreline erosion control approaches. Living Shorelines are intended to restore natural shoreline functions in estuarine, marine, and aquatic systems.